I'm enjoying following my imagination. I've found a process that I enjoy and can visualize the moment and come up with images such as these. It's cathartic and reflective of my busy lifestyle. To take time to be in the moment and like playing music, let the vibrations of color play out in my imagination. I can see the finished painting before I start. I had great seats at the National Final Figure Skating Competition that was held in Spokane, WA. It was a glamorous and exciting show. Young atheletes challenging each other with stellar performances. This level of skating exhibits the elegance and charm that is perhaps comparable to ballet. 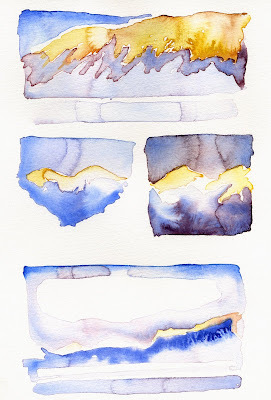 I can imagine doing paintings such as these studies in large oils and scrolls of fine linen. The skaters use their bodies to interpret music. I distill that visual impression to a gesture of color made of paint.